I’m in several budgeting groups on Facebook, and one topic that comes up ALL the time is how to save money on groceries. Everyone wants to cut their grocery bill. Everyone wants tips for couponing and cheap meals to make. Not me. I did that when we were first married and digging out of debt, but now that we have more flexibility in our budget, I’m not letting any axes near my grocery allowance! NO sir, I’m happy to buy tons of produce, grass-fed beef, grain-free flours and products, and organics, and not have to worry about the bottom line. So I look for other places to save. Like on clothes (buying fewer things overall, higher quality that will last longer, OR cheaper things if I know it’s for a temporary need), home stuff (DIYing or using things I already have), and electricity. Since we live on base, we don’t actually get billed for electricity the normal way, but if we’re over the average, we do have to pay, and if we’re under the average, we get a credit. Right now we have over $100 in credit! And when we move from here we’ll get to cash it out. Last month’s statement came this week, and we were WAY under the average usage for our neighborhood. There are a couple of ways we save on energy, and a way that might help you too that we don’t get to do right now. Curtains. We live in the desert, and now that the sun is becoming more direct and hotter for spring and summer, the usefulness of curtains is becoming even more apparent. By the time dinnertime rolls around, the sun is POUNDING our dining room through our sliding glass doors. Thankfully, I have full-length lined curtains I’ve made for the doors, and we close them when the afternoon sun starts to beat down on that side of the house. If we forget, we’re all sweating at the dinner table. If we remember, we’re as cool as cucumbers. If you live in a place that gets cold in the winter, lined curtains can help keep heat IN, too, so these are year-round energy savers! Turn up the thermostat. (Or down, in winter.) Throughout the day, we have the thermostat set for what’s usually slightly-on-the-warm-side-of-comfy. The one we have lets us adjust it, but when its next scheduled return-to-default happens, it goes back to its usual. This is great because if I’m feeling a little warm, I can knock it down a couple of degrees, it cools me off, and then it goes back up a couple of degrees. Often by then, it’s cooler outside and I don’t notice, or I’m asleep and don’t care, or I’ve left the house and it doesn’t matter. I’m sure using this technique saves us a lot! Use an energy competitor like IGS Energy to purchase from. In many states, there’s energy choice and deregulation, so you can buy energy from other companies than your utility company. The energy is still delivered through the utility (just like your mail can be delivered through USPS regardless of where you order from), but there is a variety of natural gas and electric supply products to choose from. This could save you money, since they have fixed rates, variable rates when energy costs less, green options that are still cheaper than installing your own off-grid sources, and so on. Just like you shop around for your cell phone plan, cable service, internet provider, and all the rest, you should have a chance to see your different options for energy in your home, and IGS Energy is a great one to look at! Check out IGS Companies community support for more information. 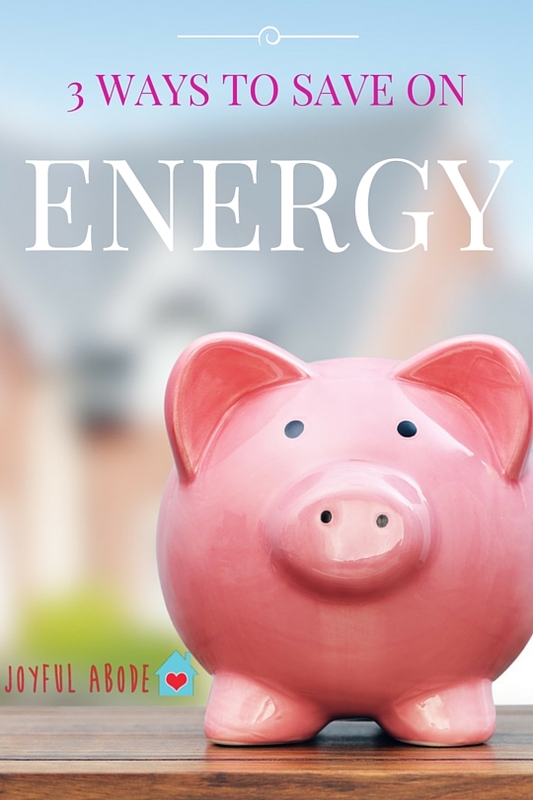 How do YOU save money on energy in your home? A couple things I always try to do is to turn the AC completely off when we’re gone during the day. In early and late summer, this is okay because the place doesn’t get super hot while we’re gone. Also, I am always colder than my husband, so when he’s away at work, I always turn the thermostat up. I’m still comfortable (or more comfortable really) and we’re saving on the AC. Another thing is when I’m not using big appliances, I always try to unplug them from the wall.